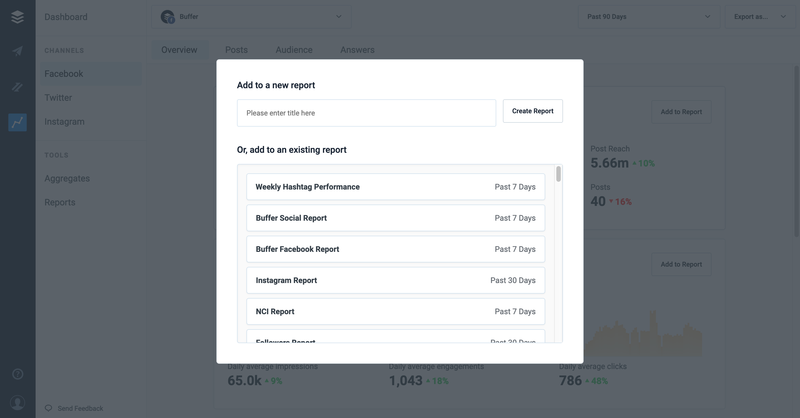 One of the key features of Buffer Analyze is the ability to create custom reports, using any of the tables and charts available throughout the tool. There is no need to create new reports each week or month, since each time you view the report, you can choose the date range you’d like to analyze. 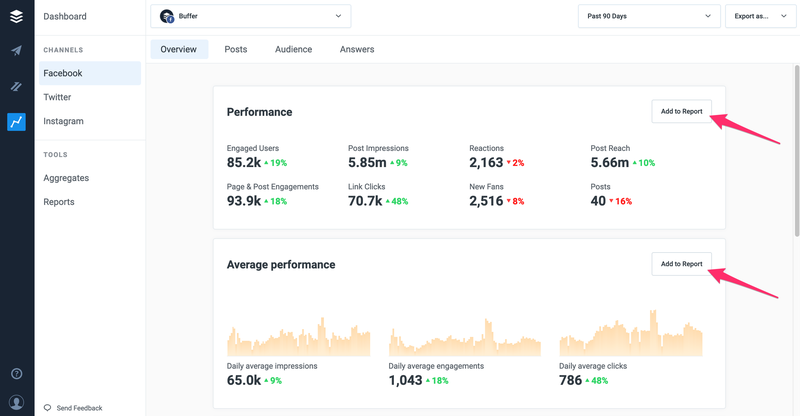 You’re able to add any of the charts and tables found within the Overview, Posts, Audience, Answers, and Aggregates tabs, to a custom report. Find a chart or table you’d like to add to a report and then click Add to Report. To create a new report, enter the name you’d like to use and then click Create Report. Alternatively, add the table or chart to an existing report by clicking on the report name. Please note, after clicking Create Report or an existing report, you won’t be taken to the report. The window will close, allowing you to add other charts and tables if you’d like to. To view your reports, select the Reports tab on the left hand side of your dashboard. You’ll see a list of all available reports. Simply click on the report you’d like to view. At the top right of the report, you’re able to change the date range you’d like to analyze. The beauty of this is that you don’t need to create new reports each week or month; you can simply use the same report and customize the date range. Rename your report by clicking on the existing name and then typing in the new title you’d like to use. Add a description to your report by clicking Add Report description. Upload a logo to your report, by clicking Upload logo on the right hand side. PNG and JPG files are supported. Each element of the report can be reordered using the up and down arrows, which are shown when hovering over a table or chart. If you’d like to remove a table or chart, hover over it and then click the x icon. You can export the report by clicking Export as PDF at the top right. Don’t forget to choose the date range you’d like to use before exporting the report.